In this review are going to talk about the Mountfield HP414 Push Petrol 4 Wheel Lawnmower, this lawnmower is actually our cheapest petrol lawnmower on our website! It actually sells for just £149 which I find absolutely amazing that they can make a petrol mower for this price! 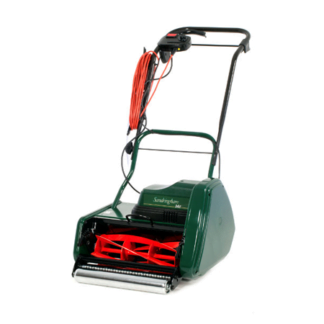 I have also created a video review on this Mountfield lawnmower, you can see the review below. I have to say the majority of garden equipment that I have used has been commercial and professional equipment, although having said this I have used a lot of domestic equipment over the years. 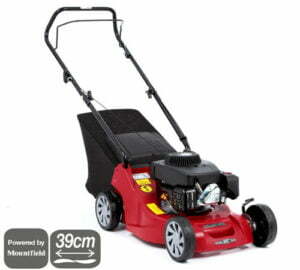 I recently used the Mountfield HP414 Push Petrol 4 Wheel Lawnmower I have to say that I was really pleasantly surprised! For a start, for a £149 lawnmower I really didn’t expect much at all, but for the money I was really impressed. 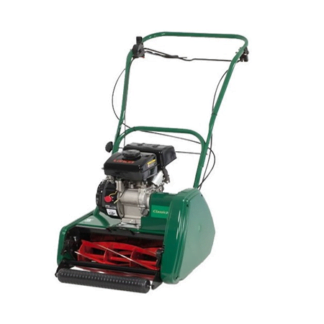 Personally, I would much prefer to have a small petrol lawnmower than an electric mower where you have that cable trailing behind you all the time and generally getting in the way, to me this little petrol lawnmower is a great option. 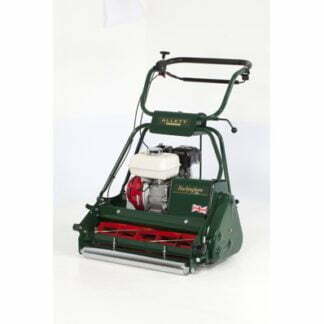 Obviously, this machine is not like using something like a Honda, Hayter or Weibang, however, we have to remember that this machine is a budget lawnmower and it really does do what it says on the box! The Mountfield HP414 Push Petrol 4 Wheel Lawnmower comes with a 100 cc petrol engine with recoil start. The cutting width is 15 inches (39 cm) which although this is not a massive cut it’s surprising and you can cover the ground, it’s also good for doing those small fiddly areas in your garden. 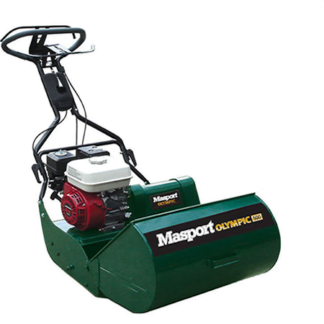 This particular machine is a push model, there are similar machines that drive, like the Mountfield SP414 Self Propelled Petrol 4 Wheel Lawnmower, however, the push model offers simplicity and very little to go wrong. Believe it or not, this machine has a height adjuster on each wheel which in some ways to me is unnecessary, however, if your grass is slightly long it is useful to be able to lift the back wheels up slightly as this makes for more efficient collecting. The height adjusters offer this five different heights from 25 to 70 mm. The grass box capacity is a generous 40 L which is quite good for a mower of this size. The handles fold down for storage which is extremely useful or if you happen to be transporting your lawnmower in the back of the car, a very useful feature. The weight of the machine is 19.5 kg and the deck is constructed of polypropylene. The recommended maximum cutting area for a machine the size is 250 m² or more if you’re feeling particularly energetic! I am very surprised that the Mountfield HP414 Push Petrol 4 Wheel Lawnmower has a two-year warranty, I wouldn’t normally expect this on a budget machine, however, it does suggest that Mountfield have faith in this particular product and from my experience, this machine is very basic but at the same time very functional. I have to say that I really was impressed with this lawnmower, I really didn’t expect very much for £149, but it achieved everything that I wanted. On one particular area, the grass was quite long and thick and although I had to empty the grass box very frequently, I didn’t manage to clog the grass chute up which can potentially easily happen! The good thing is with four-wheel rotary mowers is that the grass is directed straight into the box, whereas with a roller rotary the grass has to be pushed over the roller which makes roller mowers slightly easier to clog the grass chute. The finish that this lawnmower left was also pretty good, although it doesn’t actually have a roller, I was almost getting a slightly striped finish just due to me going up and down, I guess the deck was just pushing the grass over slightly which help to make a striped finish. However, if you really want to striped finish you need to buy a roller rotary mower. So would I buy this machine? In one simple answer, I definitely would! 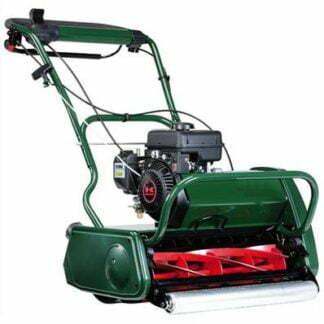 If I had a small garden I would much prefer to have a small petrol mower rather than a hand mower or electric mower. To be fair with a two-year warranty you can’t go far wrong if the machine only lasted two years and it will last longer if you look after it, it would only cost £75 a year! Obviously, this machine is not the Rolls-Royce of lawnmower’s, but if you want a budget petrol mower that cuts your grass this machine is definitely worth looking at. I always say buy the best machine that you can afford, it pays off in the long run.